In the correct Pearlescent Cherry Red with the original black interior and red carpets. A very pretty special edition Mini 30 that has covered under 36,000 miles since new with MOT certificates in the file back to 1994. 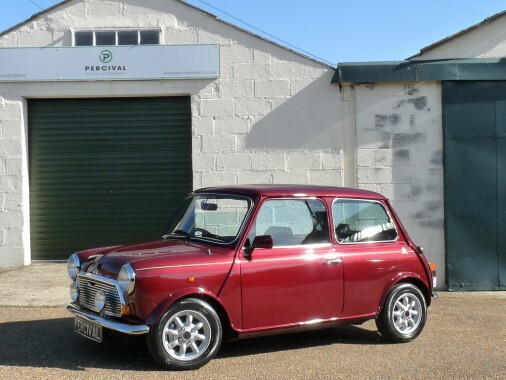 The specification includes Minilite style alloy wheels, half leather seats in black with Mini Thirty logos, front spot lights (a later addition), Mini Thirty badges on the coachlines and the lovely deep red colour. This car comes with a good history file, many MOTs, original handbooks and Mini Thirty literature including an original brochure. The Mini received a full professional respray two years to correct some paint defects from previous work and presents very well with no rust issues or deterioration. The engine bay is clean and well presented and the chrome bumpers, wheel arch extensions and exterior trims are immaculate as is the interior which is virtually unmarked. A very pretty Mini Thirty.